Who else wants to know how to lose weight fast? Do you want to slim down because you think you’ve gained some pounds? Or you want to maintain your weight for an upcoming event? Is it for a wedding? Is it for a party? Whatever the occasion is many people search for ways to lose the fat, and lose it fast. They begin to think and make plans of what they have to do for a fast weight loss. The good news is, there are a couple of things you can do on your part to drop extra pounds just in a short period of time. 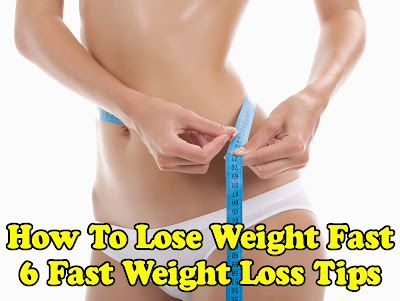 There are lots of people who are desperate to lose weight fast, and therefore depend on crash diets and other weight loss programs that claim to be the “fast weight loss” programs out there, but what a cost these people had to pay before they could shed weight. The worst part in these fat loss programs is that when you go back to eating normally, the weight you lost just miraculously come right back on. So the question is - how do you lose weight fast? Are you ready to make some changes to your eating habit? Changes that will make you lose extra pounds. My hope is that this article provides you with some useful information to begin your weight loss journey. Here in this article, we are going to look at some weight loss tips to help you lose weight fast and keep it off. These fat burning tips, not only show you how you burn fat, but how to do it in a safe and healthy way. I am going to run through 6 fast weight loss tips to help you lose fat safely and effectively. Many fitness and diet experts recommend keeping a diary of whatever food you eat and there is a reason for that. The reason is when you keep a food diary, you are able to concentrate on the foods you eat every day – is it snacks, celery, or a breakfast bar – writing it down in your journal will make you eat less. Abiding by this principle will help you cut down on calories, and cutting down on calories is the best way to a fast weight loss. You don’t only cut down on calories, but keeping a food diary also makes you keep track of what you eat and when you eat it, makes you plan the foods to eat and your calorie intake of each food. Are the foods you eat daily healthy? Do you add fruits and vegetables to your daily meal? Keeping a food diary will make things easier and help you plan out your diet. Do you want to lose weight fast? Then cut down your calorie intake. The amount of calorie you consume plays a major role on how much weight you gain. Your caloric intake is very vital, since cutting calories is the best approach to a quick weight loss. As you already know, if you keep a food diary, you would be able to cut down on your calories. Do you know that fats make foods taste good? It’s true, and this is the main reason why they’re widely known. Whether you lose or gain weight, it is influenced by your calorie intake. Bear in mind that the daily recommended calorie of each one of us is different. Therefore, if it is your desire to lose weight fast, you need to consume fewer calories every day than what your body requires. Drinking enough water throughout the day has tons of benefits including the ability to help you lose weight fast. Health experts recommend drinking at least 8 glasses of water every day to avoid dehydration as well as it flushes poisonous substances out of your system. Drinking enough water throughout the day will help you burn calories. Drink a glass of water before each meal; it will help you consume fewer calories. Fruit juice is also good for you. Exercising on a regular basis is also a great way to lose weight fast. It is safe and helps you to burn more calories. A known weight loss exercise which is believed to be very effective in losing weight is cardiovascular exercises. Cardiovascular exercises are very effective since it increases the rate of metabolism; the amount of energy expended in a given period. Doing physical exercise for about 15-20 minutes can also help you get a flat belly in just 30-45 days. Working out is good for you, but for a fast weight loss, a healthy diet plus exercise is the way to go. Is your diet helping you shed weight? Your diet plays a major role in your weight loss efforts. Slimming down safely requires you to eat healthy. Avoid eating too much food high in calorie. Add fruits and vegetables to your diet, and do not follow a crash diet. Some crash diets promise to make you lose weight fast, but the end result is you gain back the weight you lost. Eat a healthy diet every day to ensure a healthy and fast weight loss. And you will be surprised that the weight you lost, you will not gain it back.